With advances in digital signal processing techniques, modern wireless communications systems and radar systems have become increasingly digital and more constraints have been placed on packing more information into less and less bandwidth. On the wireless side, modulation formats have become more complicated with less margin for symbol error. On the radar side, modern radar systems are trying to extract more information about the targets they track and provide the ability to track slow moving targets such as automobiles and personnel in the presence of clutter. For both communications and radar systems one of the key RF parameters that limits system performance is phase noise. As systems engineers develop new and more advanced RF systems, phase noise of oscillators and transmitters can no longer be overlooked. The word radar is an acronym standing for radio detection and ranging. From this we know that the primary purposes for radar systems are to detect targets and determine their range or distance. Other key characteristics of the target may also be of interest, such as: location, bearing from the radar, velocity of the target, and size of the target or possibly even some form of target identification. Most radar systems employ pulse modulation, transmitting a short burst or pulse of RF energy, then waiting for the signal to travel to the target, reflect off of the target, and return to the radar system. By measuring the total elapsed time for the signal to travel to and return from the target, the distance to the target can be determined by knowing the velocity of propagation of the RF signal. The bearing to the target can be determined by using a narrow-beam antenna and measuring angular displacement of the antenna from north to the target. Before getting started with a discussion of pulsed phase noise, it would be good to provide some background relating to why pulse phase noise is important to radar systems engineers. The following discussion will provide some examples of typical radar applications illustrating what frequency offsets may be of importance. Target velocity is not only important for predicting target track, but also in many cases it is more important to differentiate moving targets from those that are stationary. Radars with the capability of tracking moving targets in the presence of large stationary targets such as buildings, mountains, and other forms of ground clutter are known as moving target indicator (MTI) radars. This becomes very important when we consider that the radar returns from clutter can be many times larger than that of a typical target of interest, sometimes as much as 80 to 100 dB larger. First, let us consider a small low-velocity general aviation aircraft as seen by an airport surveillance radar. From these examples we can see that common Doppler frequencies for many radars are primarily in the audio range and that they are often very close to the carrier. We can also see that if the oscillators used in the radar systems have high phase noise in this frequency range it will limit the radar’s ability determine the velocity of the target. This is very important when we consider that the radar target returns from large clutter blocks also have the phase noise of the radar transmitter impressed on them and will generally overpower the small return from targets of interest. So, as we can see, phase noise is very important to the radar systems engineer, but since most radar systems utilize pulse modulated carriers, the ability to measure the phase noise of pulse carriers is fundamentally necessary. Pulse modulated RF is produced by amplitude modulating the RF carrier with the desired pulsed waveform. Pulsed carriers can also be produced by gating an oscillator on and off; however, gated oscillators, such as magnetrons, are not phase continuous, causing the starting phase of each pulse to be random. This random nature limits gated oscillators’ use in radars that process Doppler. In addition, the random phase relationship from pulse to pulse generally prevents phase noise measurements on these sources when techniques such as phase detectors or synchronous detectors are used. Since the phase detector requires a stable reference to compare the measured signal to, it is impossible to measure phase noise with the phase of each pulse changing by large amounts. Because of the limitations of gated oscillators, we will focus our discussion of pulsed phase noise measurements on pulsed sources that use amplitude modulation to impress the pulse modulation on the RF carrier. Amplitude modulation results in the desired effect of producing an RF pulse train with continuous phase. When thinking of the modulation process, it is beneficial to remember that multiplication of the pulse waveform and the RF carrier in the time domain is the same as convolution of the pulse spectrum and the spectrum of the RF carrier in the frequency domain. From AM modulation theory we know that when a carrier is modulated with a single tone a modulation side tone is produced on each side of the carrier. This can be verified by analyzing the trigonometry identity that describes the multiplication of two sine waves. Since the spectrum of the pulse train is a series of harmonics of the PRF, we can then deduce that the AM modulation of a carrier with a pulsed waveform will result in a carrier with modulation sidebands on each side of the carrier. As mentioned above, the modulation process will convolve the carrier spectrum with the spectrum of the pulsed waveform, essentially sliding the pulse spectrum up to the carrier frequency. This will result in a spectrum that is symmetrical on either side of the carrier and is composed of spectral lines spaced n•PRF. The amplitude of the spectral lines will have the expected sin(x)/x shape with the spectral nulls occurring at 1/τ. Figure 2 illustrates what happens as we hold the PRF constant and change the pulse width. This change is shown as a change in the lobe width of the spectrum and is seen by moving left and right on the diagram. Additionally, the change in the spectrum due to changing the PRF is shown by moving up and down in the diagram. Notice as the PRF is decreased, the density of the spectral lines is increased. Note: When the PRF is increased, the spacing between the spectral lines increases. This is an important point for radar engineers who want to measure the velocity of targets. If the PRF is low, the spectral lines will be close together and may interfere with Doppler processing. Likewise, in phase noise measurements, greater spacing of the frequency lines in the pulse spectrum allows more opportunity for measuring the phase noise between the frequency lines. Figure 2 correctly shows line spectra where the spectral lines extend above and below the baseline. The lines extending below the baseline represent harmonics of the modulating waveform whose phase is 180° out of phase with the fundamental of the modulating waveform. 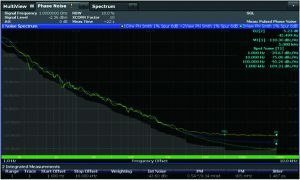 If viewed on a spectrum analyzer, all of the lines would appear above the baseline since the spectrum analyzer discards phase information. 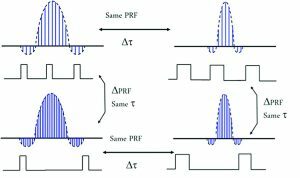 From our previous discussion you will recall that the AM modulation process created a spectrum with symmetrical side bands on either side of the carrier, where the side bands are composed of frequency lines at the PRF rate of the modulating waveform. In addition to all of the pulse modulation components, each PRF line in the spectrum will also have the phase noise of the carrier impressed on it through the convolution process. This added noise on each of the spectral lines can easily be identified by viewing the pulse spectrum (resolution bandwidth (RBW) << PRF) of a pulse modulated signal on a spectrum analyzer and zooming the span down to where just a few spectral lines are visible. Figure 3 shows the spectrum of a 1 GHz carrier modulated with a 10 µs wide pulse with a PRF of 10 kHz. Only the carrier and the adjacent PRF lines on either side are shown. From Figure 3, the phase noise side bands of the carrier can be clearly identified and it can be noted that the carrier’s phase noise has been impressed on each of the PRF lines of the pulsed RF spectrum. Notice also that a characteristic bathtub curve is formed between each line of the spectrum. From this we also notice that there is no new phase noise information in the spectrum for frequency offsets greater than PRF/2. Because of this, phase noise measurements of pulsed carriers are usually made between the carrier and a maximum offset frequency less than or equal to PRF/2. The general practice for pulsed phase noise measurements is to insert a low-pass filter following the phase detector. The filter has a corner frequency less than PRF/2 and ensures the phase noise measurement is made over a valid offset frequency range. 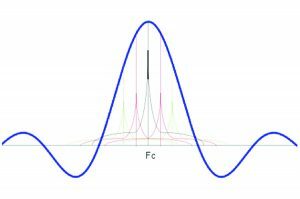 When comparing phase noise of a pulsed RF source to that of the same RF source without pulse modulation, the first question that is generally asked is: Why is the phase noise of the pulsed carrier higher than for CW, particularly at higher offset frequencies? Figure 4 is a graphic showing the phase noise of a signal generator with and without pulse modulation. 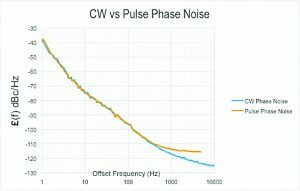 This figure (Figure 4) shows the CW and pulse phase noise of a 1 GHz carrier, as measured on a Rohde & Schwarz FSWP phase noise analyzer. The pulse modulation had a pulse width of 10 µs with a PRF of 10 kHz. Note that the maximum offset frequency shown for the pulsed measurement is 5 kHz (PRF/2). From the figure, you can see that the pulsed phase noise starts to deviate from the CW phase noise at an offset of approximately 400 Hz and is about 8 dB higher at PRF/2 (5 kHz). Comparing this graph to the spectrum we measured in Figure 3, you can see a similar shape starting in the curve. Recalling our explanation of the AM modulation process of a CW carrier with a pulse waveform, the sine wave represented by each spectral line in the pulse spectrum (see Figure 3) produces two sidebands, an upper sideband and a lower sideband. The convolution of the individual spectra produces all possible sums and differences of the CW carrier and all of the harmonic components of the modulating pulse. If phase noise sidebands are present on the carrier and the carrier is pulse modulated, the spectrum of the pulsed waveform is convolved with the carrier and its noise sidebands. Essentially, the modulation process aliased the noise sidebands of the carrier onto each of the PRF lines of the pulse spectrum weighted by a sin(x)/x function; see Figure 6. Note: No matter how great the offset between the CW carrier and the phase noise sidebands of the carrier, an alias of the noise sidebands will appear within an offset of range of ±PRF/2 from the carrier and will not be filtered off by the PRF/2 low-pass filter. As mentioned above, this is a worst-case approximation and assumes that the noise contribution at each PRF line out to the first sin (x)/x null is equal. The reason this is not an exact relationship is because of the spectral shape of the phase noise sidebands. Generally, near the carrier the noise level is falling very fast, probably 20 to 40 dB per decade. Because of the sin (x)/x envelope of the pulse modulated spectrum, aliased noise at these offsets will be well below the CW noise; however, at higher offset frequencies, up to PRF/2, the degradation will be more apparent, especially if the CW noise curve has a pedestal. 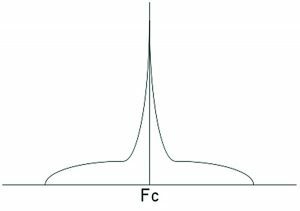 Since a pedestal in the phase noise curve represents a relatively constant energy level over a range of offset frequencies, the combined energy of the aliased noise will be greater than for a region with constantly decreasing slope. From the discussion above, you can see how the phase noise of a pulsed carrier can change as a function of PRF and pulse width. This can best be visualized by looking at an actual phase noise measurement at different pulse widths. Figure 7 shows three phase noise measurements of a pulsed carrier superimposed over one another. All of these measurements were made at a constant PRF of 10 kHz. Again, this is simply a worst case approximation of the change in phase noise. For the last measurement shown in Figure 7, the pulse width was reduced to 1 us. Therefore, the pulse width was reduced by a factor of 10 from the first measurement (blue trace) which increased the width of the main lobe of the sin(x)/x spectrum by a factor of 10, also increasing the number of PRF lines under the main lobe by a factor of ten, which should increase the phase noise of the carrier, see yellow (top) trace of Figure 7. From this, it is apparent that one should not expect the pulsed carrier phase noise of an oscillator to be the same as its CW phase noise. In addition, it is also apparent that engineers and technicians making phase noise measurements of pulsed carriers should have a good understanding of their signal generation chain and the pulse modulation used to fully understand if their measurement results are reasonable. 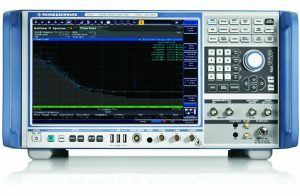 The Rohde & Schwarz FSWP (Figure 8) is a self-contained one-box cross correlation phase noise analyzer. The FSWP can perform phase noise and AM noise measurements on CW as well as pulsed carriers for carrier frequencies up to 50 GHz, without additional external hardware. 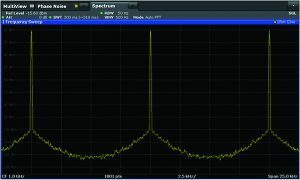 In addition to phase noise measurements, the FSWP, with Option B1, provides a full featured signal and spectrum analyzer with up to 80 MHz of digital analysis bandwidth. The R&S FSWP brings a new level of performance, speed, and ease of use to phase noise measurements. Most measurements can be made by simply connecting the signal to the analyzer and pressing a button. Once the measurement has completed, both AM and phase noise traces can be displayed; this is also the case for pulsed carrier noise measurements. In the case of pulsed carriers, the analyzer automatically measures the RF carrier frequency, pulse width, and PRF of the signal and then configures the analyzer to make the measurement, without user intervention.